An artist’s impression of the UK Pavilion. The UK and a number of European companies have launched work on their pavilions, each vying for attention at the upcoming Expo 2020 Dubai, the first such event to be held in the Middle East and Africa region. Award-winning British artist Es Devlin OBE has been signed up to design the United Kingdom (UK) Pavilion at the Expo 2020 Dubai by global brand experience agency Avantgarde. The pavilion will be the centrepiece of the UK’s presence at the Expo – highlighting the country’s expertise in artificial intelligence and the space sector. Devlin is known for creating stunning large-scale performative sculptures that fuse technology and poetry, including the interactive Fifth Lion sculpture installed in Trafalgar Square, said Avantgarde. Her dramatic design for the UK Pavilion is an illuminated sculptural message to which anticipated visitors of each of the Expos will be invited to contribute. Devlin and Avantgarde will join forces with Manchester-based structural engineers Atelier One and sustainability experts Atelier Ten for the project. Meanwhile, Austria will be using a 9,000-year-old building material made of sand, silt and clay to create its pavilion, thus showcasing an age-old technique in sustainable construction. Located at the Expo 2020’s Opportunity Thematic District, the pavilion explores historical solutions to sustainable construction, in a laid-back setting and also offers a haven for relaxation and contemplation. Austria Pavilion’s exterior will comprise about 60 interlaced cones of differing heights created from loam, a compostable soil that has been used in construction for millennia. The positioning of the cones will allow for natural ventilation, reducing the temperature by up to 10 deg C and eliminating the need for mechanical air-conditioning – representing intelligent resource-efficient architecture that is as robust as it is smart. Inside, an interactive exhibition will illustrate the theme ‘Every good idea begins with the right question’, through the stories of Austrian thought-leaders and change-makers. An Innovation Lab will stage a series of temporary exhibitions, workshops and installations, they stated. 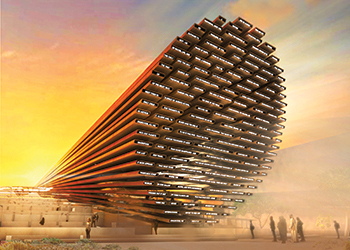 Among other European pavilions, Warsaw-based architectural studio WXCA has been awarded the contract by the Polish Investment and Trade Agency to design the country pavilion at Expo 2020 Dubai. It will be built at an investment of around PLN40 million ($10.7 million), according to public broadcaster Polish Radio’s IAR news agency. The modular structure will be inspired by Poland’s rich wildlife. It evokes the concept of mobility, stated the report citing Tomasz Pisula, the head of the Polish Investment and Trade Agency.